EPAK: EPAK is located in Kigali. The school has a total of 420 XO laptops, 350 were given by the government; another 70 laptops were given by international humanitarian organization, Right to Play. There are 680 students and 15 teachers. So that each student at the school has access, students in the morning session will share their laptop with students in the afternoon session. Laptops were first dispersed during the OLPCorps training. 15 OLPCorps members and Paul Commons, Reuben Caron, and David Cavallo of OLPC led the distribution and training sessions. On day one, the team prepped by discussing a variety of issues which were likely to emerge, such as language barriers, how to address concerns of integrating the laptops into the curriculum, etc. Teams touched upon each issue individually and designed approaches based on this discussion. For language, a majority of the translation was led by Kaçandre Bourdelais from Laval University. However, during the individual training sessions, French speakers were assigned to a separate teacher to manage translation. The training provided mostly individual attention on programs that teachers wished to explore in more depth. Teachers varied in the activities they explored, from Measure and Scratch to Turtle Art. Later that afternoon, the same teachers were seen explaining what they had learned to their students and how they'll have the same opportunity the following week. Day two began by reflashing and NAND blasting several hundred laptops before distribution--only to find out halfway though that the image file was corrupt. As a result, the majority of the morning was spent installing the latest build. By lunch time, however, all EPAK's classes had laptops. One particular lesson Corps teams took from this experience was the variety of teaching styles carried out in the classroom. Some teachers, like P1, preferred more strict, instructional techniques, a few teachers valued individual exploration, and others attempted group work. Unfortunately, unexpected power issues at the school forced us to stop by late afternoon. Kicukiro: Kicukiro Primary School is located in Kigali. There are a total of 3242 students, 44 teachers and 780 laptops. These laptops will be distributed after July holidays, so that each child has access, the Headmaster has decided that each classroom will have 20 laptops per classroom. The headmaster Felix says that "kids left their old schools to come here because they heard we would have laptops." This is the second year that OLPC has had a booth at the annual soccer tournament hosted by the Ethiopian Sports Federation in North America (ESFNA). 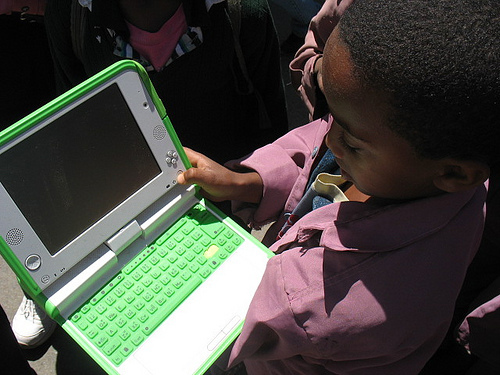 This is one of the big events of the region's Ethiopian diaspora each year, and we have been working together to bring laptops to children in Ethiopia as we strive to focus attention on children's education.